To summarize the life of a preacher extraordinaire who railed against political powers and spiritual authorities, bargained with kings, reformed a city government, published numerous works, and was ultimately burned by the pope is no small endeavor. Douglas Bonds and Douglas McComas, however, manage the feat quite well in their “Bitesize Biography” of Girolamo Savonarola (henceforth Savonarola). Following an introductory timeline, Bond and McComas discuss historical events occurring prior to (the Renaissance), during (the births of Erasmus, Machiavelli, Copernicus and Luther) and on the horizon of (namely the Reformation) Savonarola’s life. Subsequent chapters begin at Savonarola’s birth and progress to his death, touching on milestones, turning points, and disputing certain assertions about Savonarola that historians have made. Savonarola looms large in the history of Florence, his straightforward preaching swaying leaders and populace alike, ushering in moral reform. He further looms large in the Reformers minds – particularly that of Luther, who “hailed Savonarola as the precursor of his doctrine” (p.138). Bond and McComas tell Savonarola’s story with vibrancy equal to the passion of the subject himself. Although a mere window into the pageantry of 15th century Italy, Savonarola generates further interest into the people, places, and events of the day. 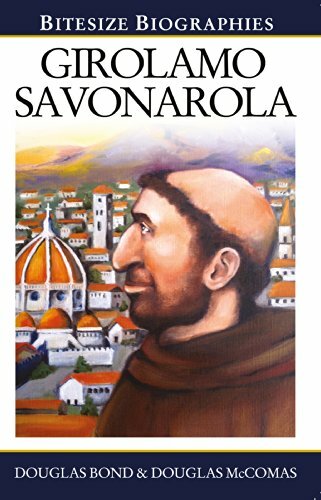 Suitable for youthful and mature readers alike, Savonarola has earned a place on our shelves.